Current Attractions It’s definitely Spring when the manzanita (Arctostaphylos spp.) and the western redbud (Cercis occidentalis) are in bloom! Together, they make a lovely couple. 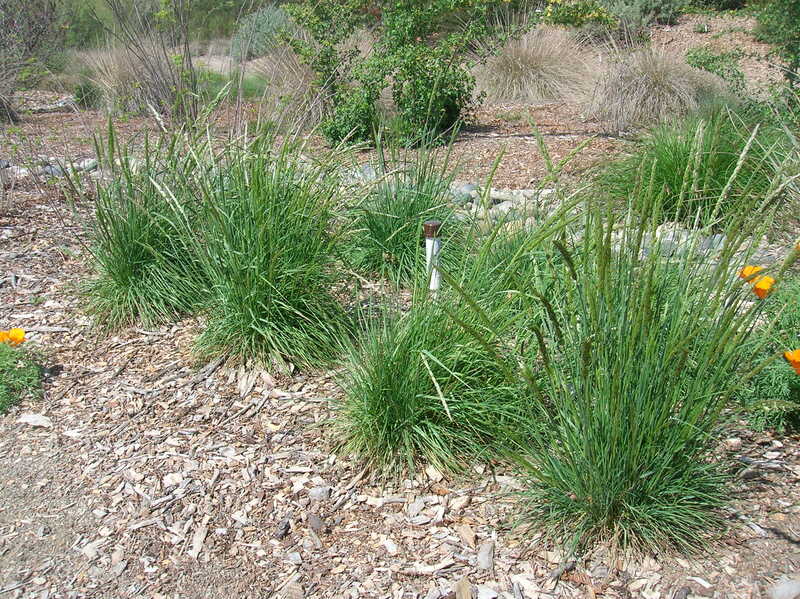 Both are genuine California native plants and would look good in any front yard. Or back yard. (Full disclosure: Manzanita and redbud are current inhabitants of the Garden, but the above specimens are in my front yard and were photographed in mid-March, 2013.) At this time of the year, the bright yellow golden currant, the lavender-hued purple sage, and the deep blue ‘Dark Star’ California lilac are also inviting visitors with cameras! A plant community is a population of different plant species which grow together where they share the same environmental needs: climate, soil type, soil depth and exposure to sun or shade. Because California has such a wide variety of these conditions, it is said that California has more plant communities than most other locations in the world — at least 30 different plant communities and sub-communities. The Granada Native Garden is guilty of presuming that four of these communities can be crammed into this 1/3-acre site. And the boundaries of these communities would certainly not be as clearly defined as our map of the Garden suggests. However, this is a demonstration garden, so we hope that you will forgive us if we attempt the unlikely! Oak Woodland In this community you may find several types of oaks, mainly the valley oak, coast live oak, blue oak and interior live oak. Other trees include the sycamore and buckeye (shown at the left, in flower last May). 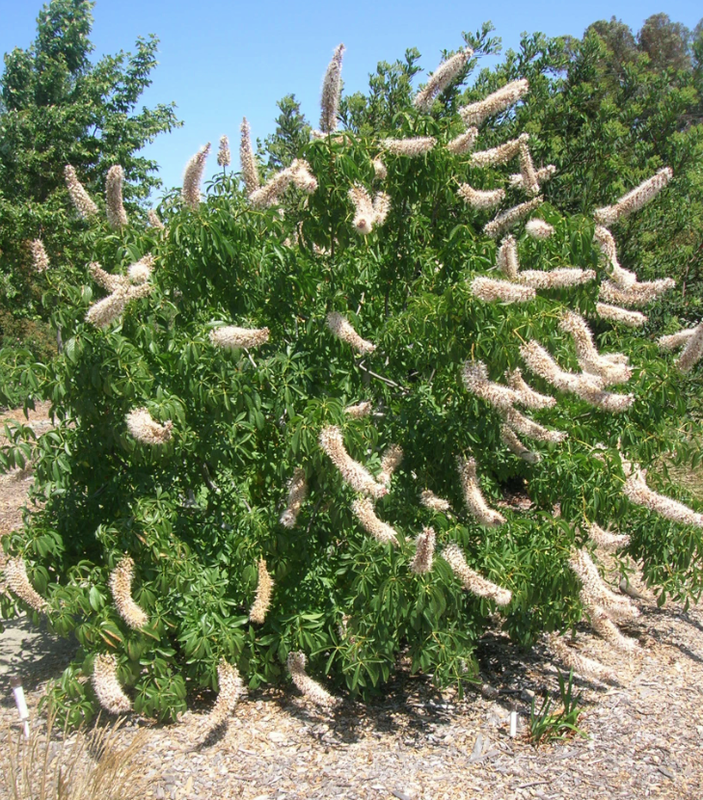 Associated with these trees are understory plants such as manzanita, coffeeberry, currant, gooseberry, redbud and toyon, as well as wildflowers such as poppies, lupine and goldfields. The oaks are especially important members of this community, because of their unique double root system. Deep roots pull up water from the water table and share it with their companion plants. Shallow roots serve the nutritional needs of the trees by absorb- ing nutrients from decomposing forest floor litter. The oak woodland community may be of the foothill type or the riparian type. The foothill woodland community (now termed central oak woodland) formerly occupied a number of valleys in California as well as the foothills, but the flat land was easier to clear for farming and the trees were easier to harvest; the hills, not so much. The riparian wood- land community lines many of the creeks and rivers of the Central Valley, and tends to exist where it was inconvenient for both humans and cattle to tread. In either case, many of these native trees require a source of water within 70 feet, and if their roots are able to achieve that depth, they thrive. At the Granada Native Garden, the valley oaks, sycamores and buckeyes seem to be doing alright, but a cottonwood didn’t make it; we have replaced it with a “baby” box elder. Riparian “Riparian” means “living on the bank of a river or stream”. In some cases, water might pool up in low lying areas for up to 3 months in late winter or spring, but if some plant likes it there, it thrives. 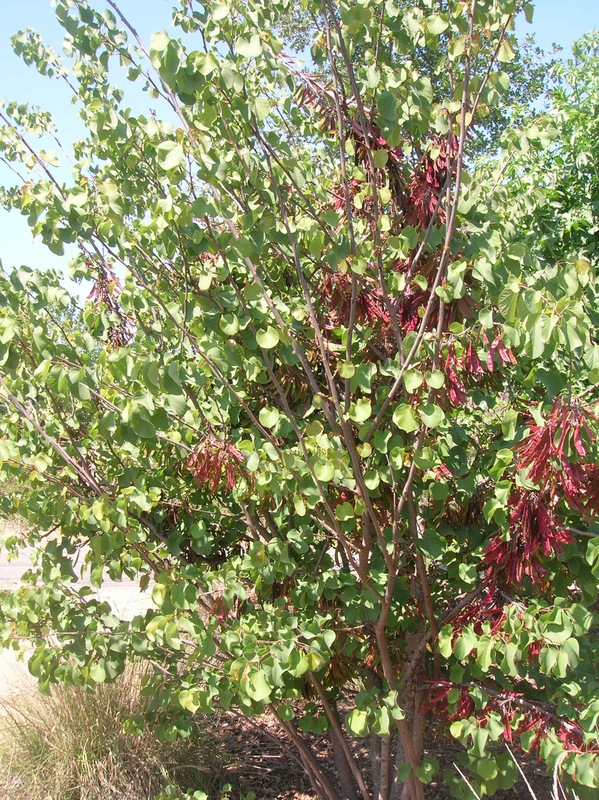 Sycamores and black walnuts are especially domi- nant in the Livermore area, but cottonwoods, redbud, willows and maples are also common. Before 1850, riparian woodland covered 900,000 acres in the Central Valley; now only about one tenth of that remains. At the Granada Native Garden, the woodland and riparian communities are adjacent to one another. Ironically, a creekbed (see the map) simulates a water source that one would expect to find flowing thru a riparian community during at least part of the year. But in reality, the only water we expect to find there is that which collects at its lowest point during periods of heavy rainfall. Chaparral A long berm along the eastern border of the Granada Native Garden is dedicated to the chaparral community, a unique habitat populated by woody shrubs and evergreens that are highly adapt- ed to fire. 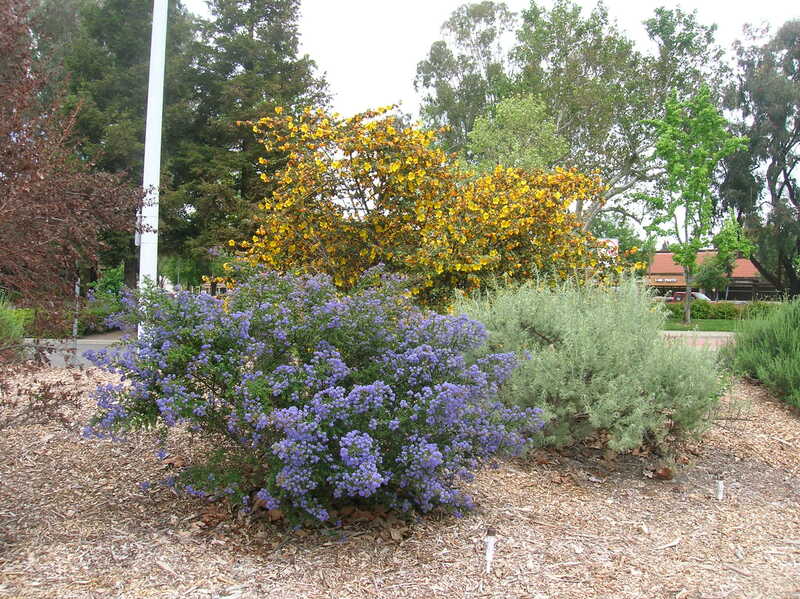 At this Garden, the species originally planted there are flannel- bush, California lilac, sagebrush (the trio shown at the right), sage, buckwheat, bush poppy and yucca; more recent arrivals are chamise, matilija poppy and nightshade. In the past, wildfires were common but infrequent in the California landscape (probably once every 30-150 years), and it is thought that chaparral species have evolved a number of mechanisms to enable them to survive exposure to fire, such as delaying seed germination until the first spring after a fire. Although fires, whether occurring naturally or intentionally set by humans, actually have many beneficial effects on the environment, fires now occur more frequently because of the increased presence of humans, and ecologists have some concern about the ability of chaparral plants to tolerate the effects of more frequent fires.